In 2009, when Bitcoin was first created, nobody could have predicted how it would change the world. Bitcoin is a digital currency. It follows the ideas set out in a white paper by the mysterious Satoshi Nakamoto, The ‘creator’ of Bitcoin, (Nakamoto), is the world’s most elusive billionaire (supposedly worth more than $7Billion as of November 2017). Very few people outside of the United States of America’s Department of Homeland Security know Nakamoto, real name. In fact, DHS will not publicly confirm that even they know the billionaire’s identity. (Nakamoto), has taken great care to keep his identity secret employing the latest encryption and obfuscation methods in his communications. Despite these efforts (according to a very credible source at the DHS) Satoshi Nakamoto gave investigators the only tool they needed to find him his own words. Using stylometry, (Stylometry is the application of the study of the linguistic style, usually to written language Stylometry is often used to attribute authorship to anonymous or disputed documents. It has legal as well as academic and literary applications, ranging from the question of the authorship of Shakespeare’s works to forensic linguistics). Using it one application they are able to compare texts to determine authorship of a particular work. Throughout the years Nakamoto wrote thousands of posts and emails and most of which are publicly available. According to a source, the NSA (The National Security Agency is a national-level intelligence agency of the United States Department of Defence, under the authority of the Director of National Intelligence. Annual budget 10.6 Billion US Dollars) was able to the use the ‘writer invariant’ method of stylometry to compare Nakamoto, ‘known’ writings with trillions of writing samples from people across the globe. By taking Nakamoto, texts and finding the 50 most common words, the NSA was able to break down his text into 5,000 word chunks and analyse each to find the frequency of those 50 words. This would result in a unique 50-number identifier for each chunk. The NSA then placed each of these numbers into a 50-dimensional space and flattens them into a plane using principal components analysis. 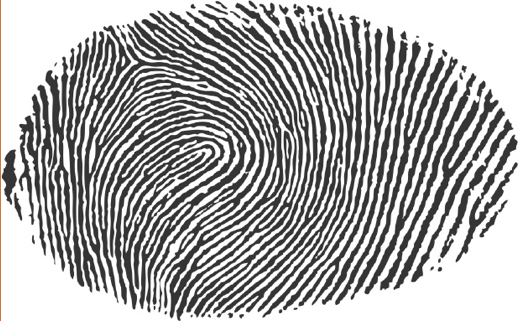 The result is a ‘fingerprint’ for anything written by Nakamoto that could easily be compared to any other writing. The NSA then took bulk emails and texts collected from their mass surveillance efforts. First through PRISM (a court-approved front-door access to Google and Yahoo user accounts) and then through MUSCULAR (where the NSA copies the data flows across fiber optic cables that carry information among the data centers of Google, Yahoo, Amazon, and Facebook) the NSA was able to place trillions of writings from more than a billion people in the same plane as Nakamoto, writings to find his true identity. The effort took less than a month and resulted in positive match. This wasn’t the first time efforts had been made to unearth the identity of Nakamoto, using stylometry. 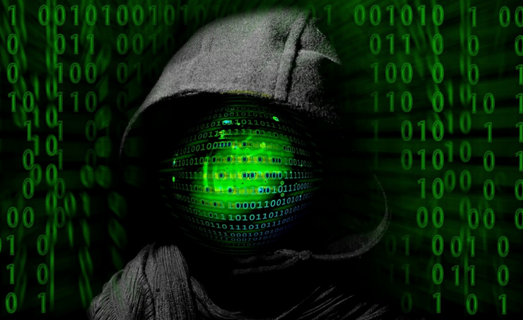 Various reporters and members of the Bitcoin community have used various open source stylometry tools to attempt to uncover the true identity of Bitcoins creator. What was their problem? They didn’t have access to trillions of emails from a billion people and they weren’t able to plug them into a supercomputer. The NSA’s proprietary software, bulk email collection ability, and computing power made it possible for them to conclusively identify Nakamoto. But why is it so? Why go to so much trouble to identify Nakamoto? Sources tells us that as far back as the Obama administration were concerned that Nakamoto, was an agent of Russia or China; that Bitcoin might be weaponised against free nations in the future. Knowing the source would help the administration understand their motives. As far as I can tell Nakamoto hasn’t yet violated any laws and I have no idea if the NSA determined he was an agent of Russia or China or just a Japanese crypto hacker. Bitcoin offers the promise of lower transaction fees than traditional online payment mechanisms and is operated by a decentralized authority, unlike government-issued currencies. Today’s market cap for all Bitcoin (abbreviated BTC or, less frequently, XBT) in circulation exceeds $9 billion. There are no physical Bitcoins, only balances kept on a public ledger in the cloud that – along with all Bitcoin transactions – is verified by a massive amount of computing power. Bitcoins are not issued or backed by any banks or governments, nor are individual Bitcoins valuable as a commodity. 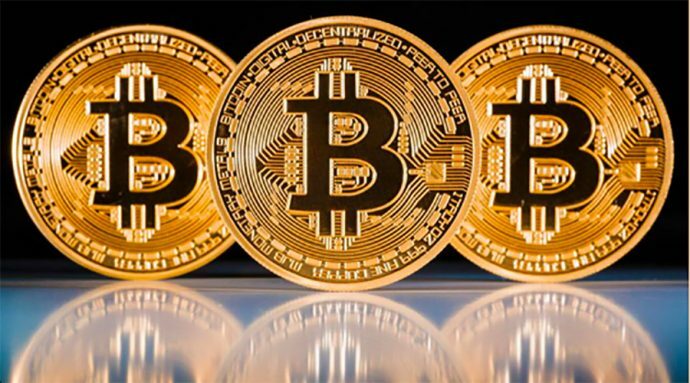 Despite its not being legal tender legal tender, Bitcoin charts high on popularity, and has triggered the launch of other virtual currencies collectively referred to as Altcoins. 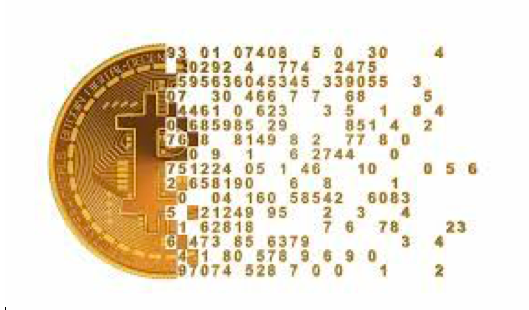 Bitcoin is a type of crytocurrency; balances are kept using public and private “keys,” which are long strings of numbers and letters linked through the mathematical encryption algorithm that was used to create them. The public key (comparable to a bank account number) serves as the address which is published to the world and to which others may send Bitcoins. The private key (comparable to an ATM PIN) is meant to be a guarded secret, and only used to authorize Bitcoin transmissions. 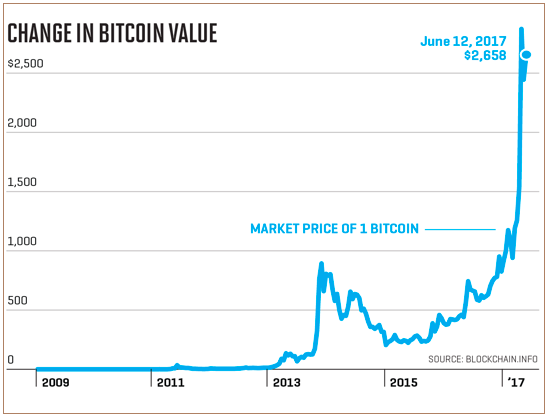 The value started out insanely cheap and hit a bump in 2013 that took it to about $250 per Bitcoin. Once Bitcoin futures hit the CME Group, the price of Bitcoin skyrocketed to nearly $20,000 (as at November 2017). Think of it this way: If you’d invested $100 on January 1, 2011, when one Bitcoin was valued at .30 cents, those bitcoins could be worth around $5 million today. Bitcoin has been the de facto currency of the “Dark Web”, the ‘hidden’ Internet accessible only by Tor. Tor is free software for enabling anonymous communication. The name is derived from an acronym for the original software project name “The Onion Router”. Tor directs Internet traffic through a free, worldwide, volunteer overlay network consisting of more than seven thousand relays to conceal a user’s location and usage from anyone conducting network surveillance or traffic analysis. Using Tor makes it more difficult to trace Internet activity to the user: this includes “visits to Web sites, online posts, instant messages, and other communication forms”. The intent for Tor’s use is to protect the personal privacy of its users, as well as their freedom and ability to conduct confidential communication by keeping their Internet activities from being monitored. But just how much do we know about these new underground economies? 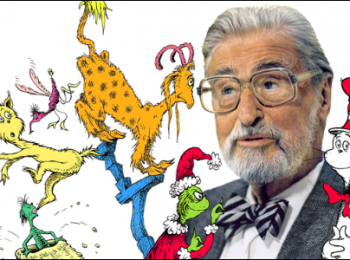 Who is buying and selling – and what? Here’s what available data can tell us about Bitcoin on the Dark Web. A few years ago on the afternoon of Oct. 1, 2013, a tall, slender, shaggy-haired man left his house on 15th Avenue in San Francisco. He paid $1,000 a month cash to share it with two housemates who knew him only as a quiet currency trader named Josh Terrey. His real name was Ross Ulbricht. He was 29 and had no police record. Dressed in jeans and a red T-shirt, Ulbricht headed to the Glen Park branch of the public library, where he made his way to the science-fiction section and logged on to his laptop using the free wi-fi. Several FBI agents dressed in plainclothes converged on him, pushed him up against a window, then escorted him from the building. The FBI believed Ulbricht is a criminal known online as the Dread Pirate Roberts, a reference to the book and movie The Princess Bride. The Dread Pirate Roberts was the owner and administrator of The Silk Road, a wildly successful online bazaar where people bought and sold illegal goods–primarily drugs but also fake IDs, fireworks and hacking software. They could do this without getting caught because The Silk Road was located in a little-known region of the Internet called the Deep Web. In May 2015 Ross Ulbricht, was sentenced to life in prison without the possibility of parole. “The stated purpose [of the Silk Road] was to be beyond the law. In the world you created over time, democracy didn’t exist. You were the captain of the ship, the Dread Pirate Roberts,” she told Ulbricht as she read the sentence, referring to his pseudonym as the Silk Road’s leader. “Silk Road’s birth and presence asserted that its…creator was better than the laws of this country. This is deeply troubling, terribly misguided, and very dangerous”. Technically the Deep Web refers to the collection of all the websites and databases that search engines like Google don’t or can’t index, which in terms of the sheer volume of information is many times larger than the Web as we know it. But more loosely, the Deep Web is a specific branch of the Internet that’s distinguished by that increasingly rare commodity: complete anonymity. Nothing you do on the Deep Web can be associated with your real-world identity, unless you choose it to be. Most people never see it, though the software you need to access it is free and takes less than three minutes to download and install. If there’s a part of the grid that can be considered off the grid, it’s the Deep Web. The Deep Web has plenty of valid reasons for existing. It’s a vital tool for intelligence agents, law enforcement, political dissidents and anybody who needs or wants to conduct their online affairs in private–which is, increasingly, everybody. According to a survey published in September 2015 by the Pew Internet & American Life Project, 86% of Internet users have attempted to delete or conceal their digital history, and 55% have tried to avoid being observed online by specific parties like their employers or the government. But the Deep Web is also an ideal venue for doing things that are unlawful, especially when it’s combined, as in the case of The Silk Road, with the anonymous, virtually untraceable electronic currency Bitcoin. “It allows all sorts of criminals who, in bygone eras, had to find open-air drug markets or an alley somewhere to engage in bad activity to do it openly,” argues Preet Bharara, U.S. attorney for the Southern District of New York, whose office is bringing a case against Ulbricht. 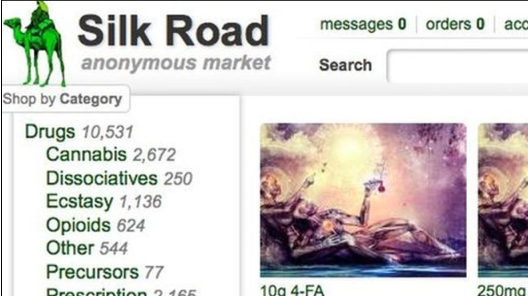 For 2½ years The Silk Road acted as an Amazon-like clearinghouse for illegal goods, providing almost a million customers worldwide with $1.2 billion worth of contraband, according to the 39-page federal complaint against Ulbricht. The Dread Pirate Roberts, the Deep Web’s Jeff Bezos, allegedly collected some $80 million in fees. Court cases have documented Facebook as being used by pedophiles to groom children, domestic violence offenders exploiting it to stalk victims and terrorists going online to recruit. A Facebook spokeswoman said “all users must abide by community standards which prohibit the site being used to facilitate or organise criminal activity that causes physical harm to people, businesses or animals — or financial damage to people or businesses”. “We work with law enforcement when we believe there is a genuine risk of physical harm or direct threats to public safety,” she said. When researching this article, I typed into my web browser “how to access the dark web”? Within minutes, Google was in touch with a message of inquiry. Don’t be foolish enough to believe that they are not watching your every keystroke, but when it comes to assisting police, or regulatory authorities, they are far less willing to cooperate. You can draw your own conclusions, I certainly have.